What I Like: Postcards: Worldwide new Stamps: I collect worldwide. banknotes too and coins. Stickers: any kind FB's/SLAMS/DECOS: Please send me some. Key Chains: Anything that says your city/state/or country on it. Hommie's Figures Spinning Tops Tea: USA/ Worldwide Coffee: USA/ Worldwide Cocoa: USA/ Worldwide Candy: Any kind (worldwide) & USA Chocolate's: (worldwide) & USA Phone Cards: Used USA/Worldwide Bennie Babbie's:I collect 'em. Friendship Bracelets: Homemade Items Recipes: Worldwide ones. Mix CD's or Cassette Tapes: I love music mixes from all over the world. Hard To Find Things Worldwide Scented Body Oils For Men, Doggies Treat: White skinny rawhide bones Chicken flavor in a plastic packet. Halloween Stuff (seasonal) Christmas Stuff (seasonal) Greeting Cards Surprise Packets Lucky Charm's (not the cereal) Pen-Pals: USA/Worldwide please send your letters w/photos... Phone Pal's: Chatting to people USA/Worldwide by phone. Please ask me for my Phone number. Well I like all kinds of music and it depends on my mood. I like Pop, Soft Rock, Club Dance Mixes, Techno, Electronic, Reggae... I am also a part-time DJ. Oh my do I love Movies....Well I will say it's getting slightly expensive to go to the cinema, but I did go see..."ZOMBIE LAND" (I enjoyed it), "HALLOWEEN 2" (OMG...scary), "THE FINAL DESTINATION 3D" (I want to see), Oh NETFLIX I rent all the time and see tons of movies coming to my mailbox weekly. I can say I enjoy Origami (Japanese Paper Folding), but now it's becoming more an Oriental thing in many Asian countries too. I like to collect/swap FB's (FRIENDSHIP BOOKLETS, SLAMS and DECOS. I'm still learning ATC's so anyone please pass along some over to me so I can actually see what they look like. May 26th, 2015: My dog Lu Lu has a wish... Please help save my life I'm dying from a cancerous tumor cist. Her website is: http://www.giveforward.com/fundraisers/9rx8/please-help-save-lu-lu . Her photo is there and story on her too. Phone Pal's is: Having someone to chat with in another state or another country. Please message me for my phone number. I have several Phone Chat Pal's. I do enjoy pen-pals from all over the USA and worldwide too. I like to receive all those FB's, SLAMS and DECOS. As for postcards: I prefer New 4 X 6 and 5 X 7 in size and will swap 5 to 10 per envelope. No Free Ad Cards! I do enjoy doing Private Postcard Swaps, so if your interested just message me. I do like City/Skyline/Aerial Views, Lighthouses, Waterfalls, Beach/Oceanfront Views, Disney, Bridges and Covered Bridges, Mountains, Castles, Hawaii, Guam, U.S.V.I., etc... Always send me a message if your interested in swapping something. Comment: Thank you for the pretty Christmas card and postcard. Comment: Sorry for the late rating. Thank you for the cute puppy card & Michigan pc. Merry Christmas! Comment: The only circular card in my display! Happy holidays. Comment: Thanks for the wonderful banknotes and for the private swap. Comment: Merry Christmas Dave! You are my first guy swapper. I've been here since 2008 and never once had a guy swapper. I think it's great & about time, lol ! Thank you for the really nice card, the post card, and Snowman napkin. Love snowmen! Hope you have a wonderful Christmas Dave! Comment: Thank you for the lovely card and the holiday wishes. Merry Christmas to you and your family. Comment: Thank you so much I loved the postcards and can't wait to add them to my collection! Comment: Thanks for the card and the PC! Comment: Thanks for the Christmas card, banknote, coin and extra postcards. Comment: Thank you so much! I love the stickers, especially the elves! Happy Holidays! Comment: Great cards, thank you very much. Grew up outside of Chicago. 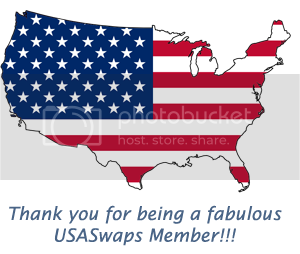 Welcome to One Stamp Swaps! Can't wait to meet you in a swap sometime! Just wanted to say your profile was an entertaining read.